We don’t talk politics here. I strictly avoid it. I do not want to be divisive or to draw a line in the sand. I strongly believe that everyone is entitled to their opinion and their decisions and want to embrace that more than I care to strongly state my opinion on certain topics,specifically politics. But this year has been a hard one to keep our voices quieted. 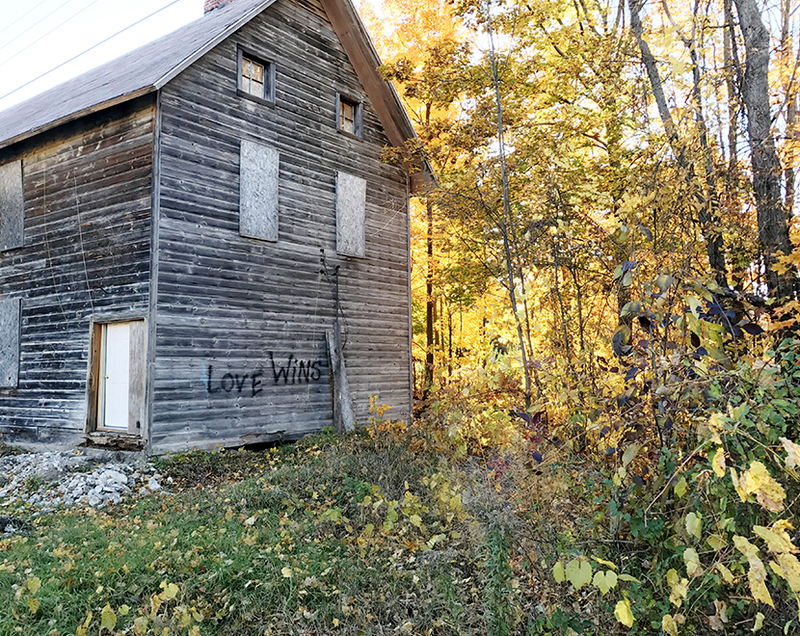 The other day while I was taking my normal loop walk with Hayes around the dirt roads that surround our house an old building had recently had “Love wins” written on the side of it. It got me emotional. It was the reminder I needed during this election that not only is love the greatest thing we experience as humans, is something we all have a right to as humans, but also that passion is the ultimate source of freedom no matter how hard the world attempts to tell us differently. That little saying on a building that I walk past nearly every day, made me realize that I couldn’t just sit silent during this pivotal moment. This election has not just affected us here in America but it is being watched by everyone around the world. Many of you who are around our age (late 20’s and early 30’s) have had the opportunity to vote in elections. Some of us have taken that opportunity and some of us have not, but this year it is time to take that opportunity. I am not going to sit here and tell you who to vote for or try to sway your thoughts, there is enough of that out there, but all I can say is I hope you vote. I hope you vote having done the research from every angle, every place, every way you could, with the most well-rounded education you can give yourself. I hope you vote knowing that this is a wonderful right you have in this country and many around the world do not have this luxury. I hope you vote knowing where we came from as a country. I hope you vote with the intention of where we are headed. I hope you vote with the reality of where we are right now. I hope you vote because you are hopeful and not fearful. I hope you vote knowing the world is watching and counting on YOU. I hope you vote and encourage everyone around you to do the same…hell drag your co-workers, spouse, roommate, and/or friend with you to the polls. I hope you don’t just cast a vote out of compromise but out of strong belief and education even if you aren’t happy with where we are. I hope you make your decision for yourself even if it isn’t the popular one. I hope you walk away proud during this election. I hope you vote for the people you love. I hope you vote with love. I hope you vote with hope. I hope you vote with acceptance. I hope you vote and then choose to look across the aisle and extend a hand no matter the results. That is all I ask. We voted absentee this year and I am sad I cannot stand in an election booth this year and rock an “I Voted” sticker. This election is history in the making, just as any election is, but this one… this one ever more so. So, I beg of you to be apart of it and I know the rest of the world does too. We cannot forget that no matter how out of control and disappointing this campaign season has been, we still hold the ultimate say by filling in one little bubble. Go vote not just for you, not just cause I said so or anyone else did, but because we are all counting on each other to make our voice heard this year. Happy Election. Now go vote, won’t you?! Thank you for this beautiful and very thoughtful post. I love the sensitive way you worded it, especially with the way things are. I enjoy your blog immensely. It’s filled with such gorgeous visual and written stories! Yes! Love over derision. How important we all sing out together and speak our voice. Well said, Megan. Thank you For not posting your opinion. I didnt have to unfOllow yOu like i did so many other blogs!